Delphi 10 Seattle is the latest version of a long line of Object Pascal development tools (obviously). It has code completion, visual form designing, and syntax highlighting. You will need the Delphi compiler to compile your code from most of the other object pascal code editors. Delphi is a commercial product but the RTL source code is available with the product. Delphi is targeted at both the desktop developer and the mobile developer (with some web developer thrown in on the side). Trolledge is a beta code editor for Win32, Win64, and Mac OSX. It has syntax highlighting and code completion. You can edit the form files as well in text format. Trolledge is free and open source and has been built using the Firemonkey framework. Trolledge is a work in progress but it is great as a companion editor for Delphi. Currently Trolledge does not integrate with the Delphi compiler. It is targeted at the mobile developer and provides specific support for viewing APK and IPA files. There is also an article about the creation of Trolledge. OmniPascal is a syntax highlighting and code completion plugin for Visual Studio Code. OmniPascal is closed source but Visual Studio Code is open source. OmniPascal is a work in progress but already is very feature rich and a great companion editor for Delphi. OmniPascal can be configured to integrate with the Delphi compiler. Visual Studio Code is available on Windows and Mac but at this time OmniPascal is only available on Windows. Visual Studio Code is targeted at the web developer. There is also a second Pascal syntax highlighting plugin for Visual Studio Code by Alessandro Fragnani. I-Pascal is a syntax highlighting and code completion plugin for the InteliJ IDEA IDE. I-Pascal integrates with the Delphi and the FPC compiler. It has a lot of unique features like a DCU2INT processor and productivity features. The InteliJ IDEA IDE is available for both Windows and Mac OSX. The I-Pascal plugin appears to be written in Java (as is the IDE) so it should run on both platforms as well. Lazarus is a Object Pascal code editor with syntax highlighting, visual form editor, and code completion. Lazarus integrates with the FPC compiler. Lazarus is open source and available for a number of different platforms including Windows. FPC Object Pascal code is not 100% compatible with Delphi Object Pascal code but you can interchange between the languages pretty easily. Lazarus is mainly targeted at the desktop developer. Notepad++ is a popular text editor with developers and there are a number of Object Pascal syntax highlighting plugins for it. There is a DelphiPluginTemplate which is open source and then there is another Object Pascal plugin for Notepad++ here. Notepad++ is more along the lines of a text editor with large file support and just syntax highlighting. Notepad++ is open source and only available for Windows. Mix and match the code editors for Object Pascal listed above based on your needs and budget to come up with the best development toolset for you. 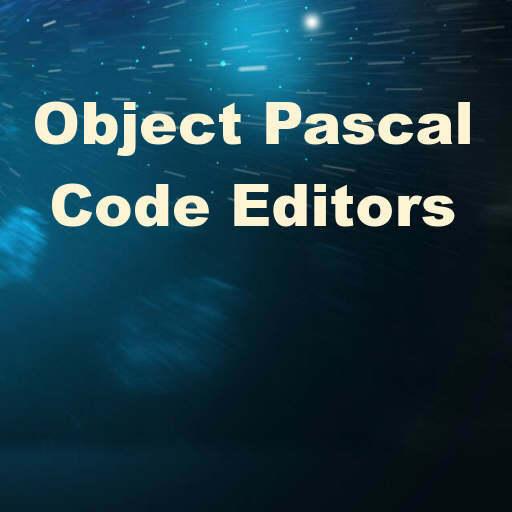 Post your favorite Object Pascal code editor in the comments if we missed it! Boxer Text Editor, by Boxer Software, is the perfect sidekick for Delphi, IMHO. Powerful macro language, key macro recorder, templates, syntax highlight and whatnot. Its interface is showing some signs of age, but it is a superb text editor nonetheless. Not free, but worth every cent.